When there is a need to take into account a person’s daily attendance, be it in school or work, it is a must to use an efficient system to do so. Traditionally, a document is passed around or present upon entrance on the building so the person can sign in. 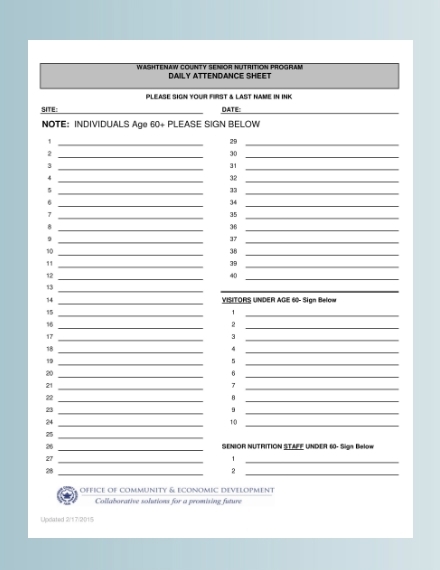 A daily sign-in sheet is a document where people can write information about them to serve as their daily attendance. In the same sense, a daily sign-in sheet is also used to record the people who enter the establishment or offices. 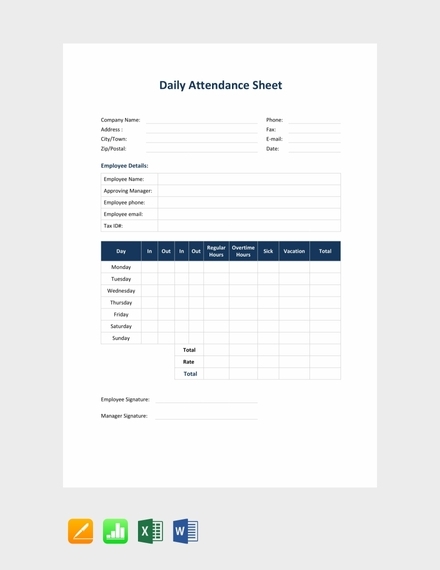 Although writing on paper for this purpose is considered as old fashioned, it is still an effective way to record and take into account people’s attendance and information. 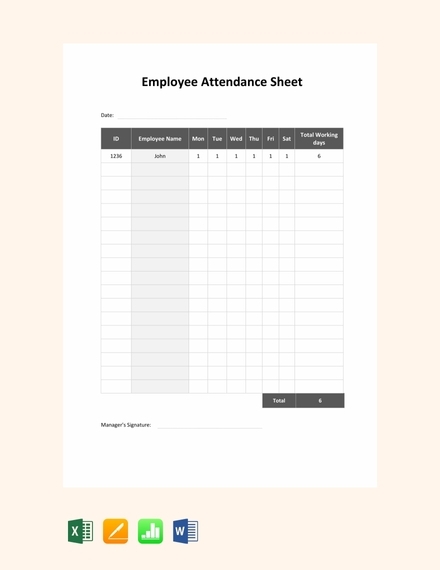 When strictly implemented, it can be a good way to track people and verify their attendance during a specific day and time. 1. Sheet heading/title: Your daily sign-in sheet must have a heading/title that will inform the person what he/she is signing in for. In this case, the words DAILY SIGN-IN SHEET must be boldly written on the uppermost part of the sheet. Including a heading/title for your sign-in sheet is important not only because it helps the person know what the sheet is for, but to also help you identify the sheet easily. 2. Additional informative details: Aside from the sheet heading/title, you should also provide additional details on your daily sign-in sheet. 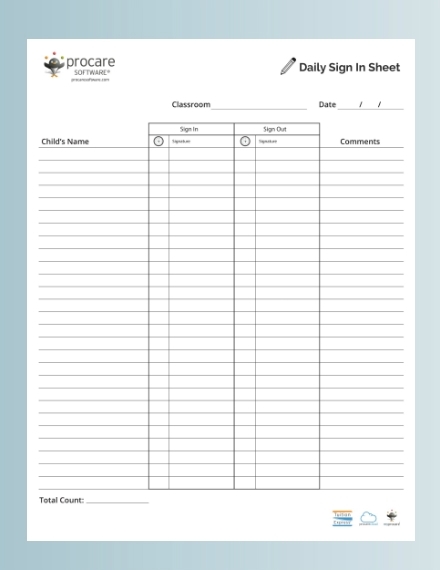 When used for school, the sheet should include the name of the class/subject it is for, the exact date and time. Same goes for a daily sign-in sheet used for establishments or offices, the class/subject name should be removed. The additional details should be placed below the sheet heading/title. 3. Columns and rows: The number of columns will depend on what purpose the daily sign-in sheet will be used for, but regardless of that, it should have enough rows and columns. The columns will be where specific information is written and the rows for each individual/person filling out the sheet. It is important to separate information and names from each other in order to avoid having a messy daily sign-in sheet. 4. Appropriate column labels: In order for the people to clearly understand where they need to write specific information, each column must have an appropriate label. The labels should be indicate on the first column on each row and it should be bold and big enough for the person signing in to see. Including labels will help you get the information that you need from each person signing in. 5. 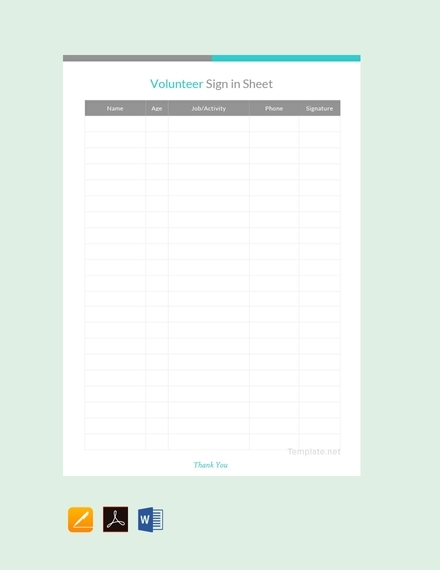 Clear layout: A daily sign-in sheet does not need fancy layouts. It should be simple and direct in order to avoid confusing the people when they fill it out. It is also important to consider which page layout is more efficient for you, portrait or landscape; choose which will help you get all the information that you need in a single page. 1. Change page setup: Once you have your Microsoft Word launched on your computer, open a new blank document. First order of business, change the your page setup; change your paper orientation as well as your margins. Choose the setup that will allow you to utilize a single sheet better and will allow you to include as much information or columns and rows as needed. To do this, click Page Layout, then click margins to choose the margin size that you prefer; there are available options you can choose from and you can also customize you own. After that, click Orientation to change your page to portrait or landscape layout. 2. 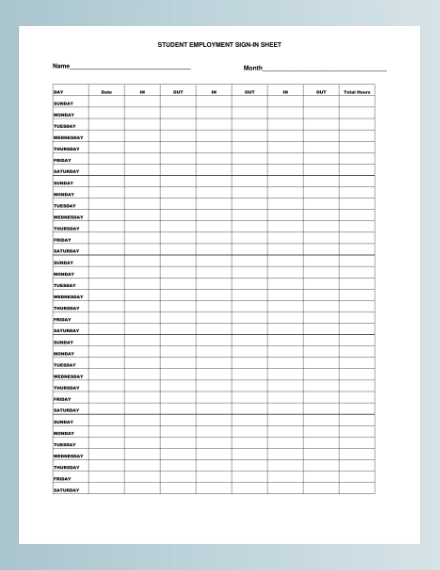 Add page heading/title: As mentioned earlier, having a heading/title for your daily sign-in sheet is essential. 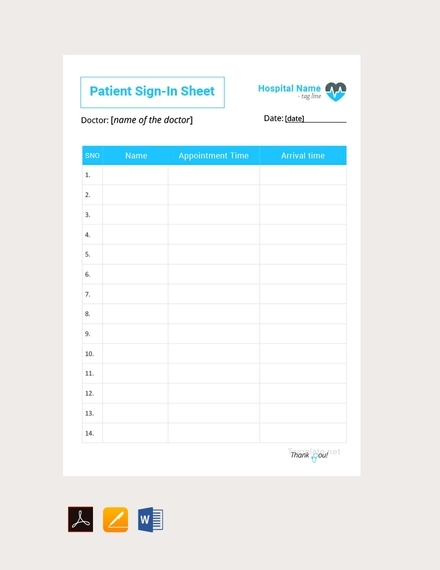 It informs people what the sheet is for before they fill out the sheet and it gives them an idea on why gathering some personal information is important. To add the heading/title, just type your preferred heading/title, e.g. 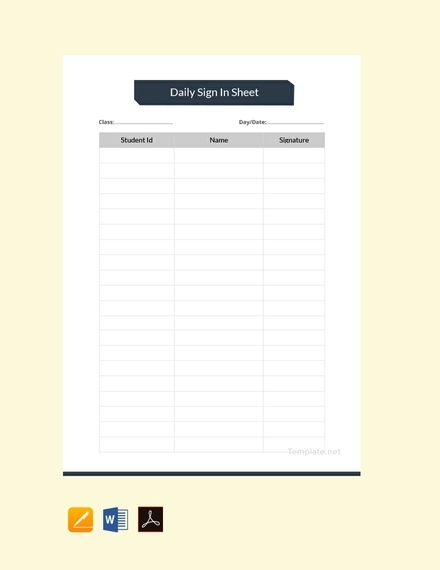 Daily Sign-In Sheet and change the font style and size. To make sure your heading/title is centered and aligned, change the text alignment to center by going to the paragraph group of tools then click the center alignment. 3. 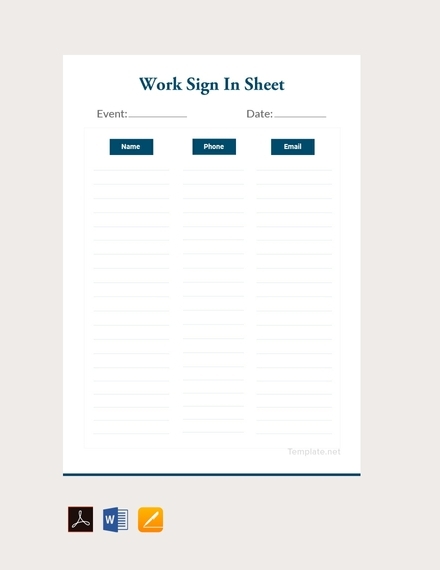 Insert table: A single or few spaces after the heading, insert the table for your daily sign-in sheet. Using a table is more efficient since you customize the columns and rows you will include. To insert a table on your page, click the Insert tab and click the Table. After clicking the Table option, it will give a drop-down of the options you can choose from. A grid form of the table where you can manually choose how many rows and columns you will include is available. However, if you want more rows to insert it is better to choose the Insert Table option where a new window will open allowing you to input the number of rows and columns you wish to include. 4. Add column label: As mentioned earlier, it is necessary to put labels on each column so that people signing in will know what specific information to write on a particular column. Write the column label on the first column in each row. Make sure that the label is clear and direct, use a font style and size is easily readable. You can directly write on the columns, no need for special buttons. You can also add numbers for each row so that you can easily account for the people on the list. 5. Proofread and edit: Once you have made all the necessary steps, you can begin proofreading your sign-in sheet. Make sure there are no mistakes in spelling, grammar, spacing, punctuation, etc. Edit the sheet as you see fit; adjust the width and height your each row and column, add highlights, etc. Make sure there are no mistakes and everything is clear before you begin printing. Ensure that heading and labels are bold and easily readable and understandable. Give people enough space to write the information that you need by adjust width and height for each rows and columns. It is best to ensure that the whole table fits the entire page to avoid confusion and to save paper. Your sheet can include all days of the week fit in a single page if you only need a few information. If you don’t want to include all the days of the week on a single sheet, make sure you provide additional information such as the day, date, time, etc. Provide as much context as possible in order to make it easier for the people to understand your purpose and what they should do. Depending on your preference or the number of information you wish to gather, the size of the paper you use can be whatever that fits those that you need. 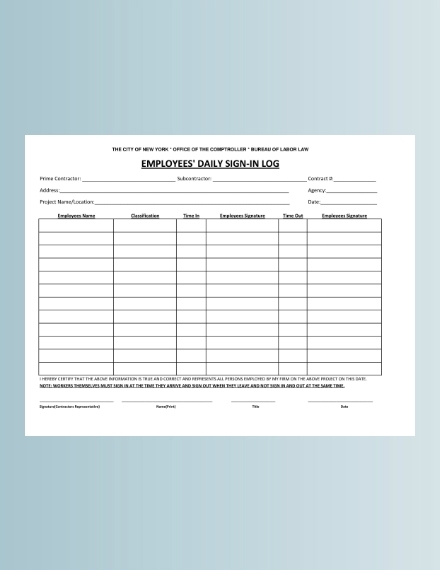 A daily sign-in sheet can be on a 8.5″ × 10.98″ paper or a 8.5″ × 14.02″. The paper size you use for sign-in sheets is entirely up to you and how you layout your table. 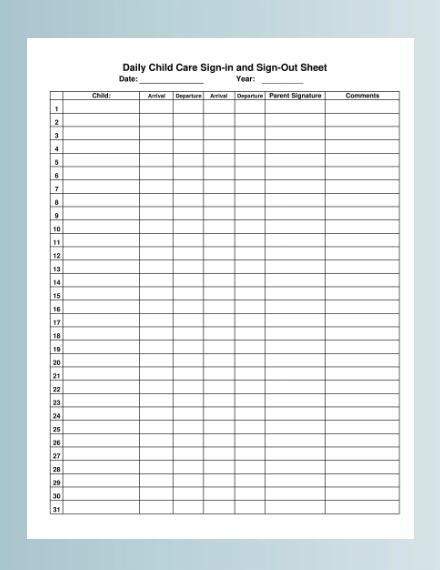 What is a daily sign-in sheet? 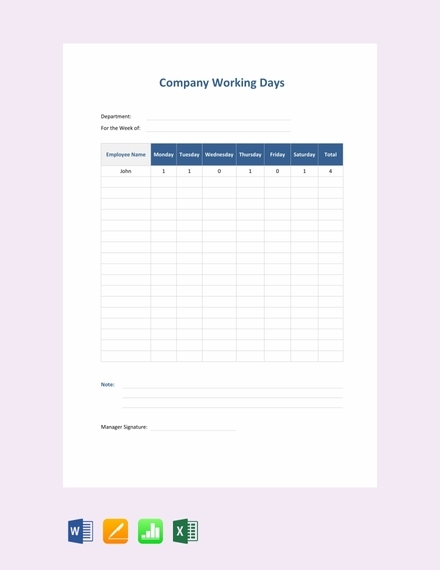 A daily sign-in sheet is basically a daily log where people part of a class, company, or entering an office fill out with their name and other information. 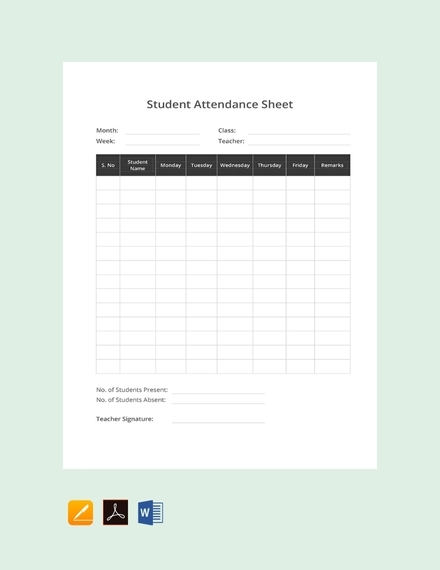 In this sense, a daily sign-in sheet is an attendance sheet that takes the daily attendance of the students attending class, employees present at work, visitors going to offices, and so on. Is a daily sign-in sheet important? 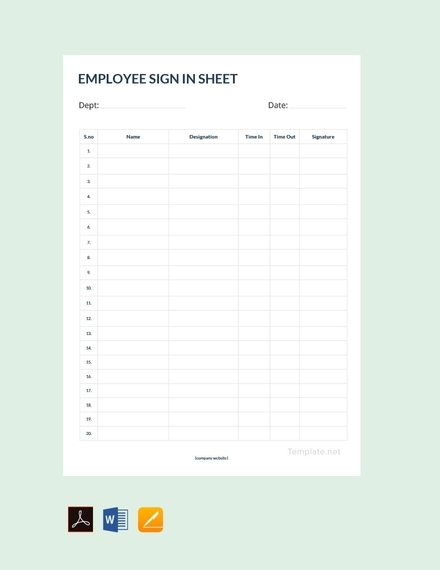 A daily sign-in sheet is important and necessary if there is a need to take into account the number of people attending a class, present at work, people entering the building, etc. On the other hand, a traditional paper-and-pen daily sign-in sheet is not commonly used nowadays; instead, institutions, organization, establishments, etc. prefer to use digital or web sign-in sheets for efficiency.